Welcome to the website of the European Bible Training Center, a ministry in partnership with Grace Community Church missionaries. Browse around a while and read about the great things the Lord is doing here in Germany! Below you will find a brief description about the training center. The European Bible Training Centre (EBTC) officially began as a ministry of the church "Die Christburg" on September 13, 2001. The ministry is located in what was formerly East Berlin. Having returned to their native Germany after training at The Master's Seminary in California, Christian Andresen and Dieter Borchmann are fulfilling a vision for their homeland. Along with Cary Green, they are planting a church that is solidly committed to the authority of Scripture in the land of Martin Luther. As they do so, they are also establishing a Ministry Training Centre that has the unique opportunity and challenge of reviving expository preaching in the land of the Reformation. They are committed to preparing German men to preach, while planting and leading evangelical churches in Germany and throughout Europe. EBTC offers a one-year Bible survey curriculum with basic theology and a two-year preacher's institute program. The Centre holds classes one weekend (Friday morning–Sunday afternoon) per month, for three months each trimester. As a service to the evangelical community, it also offers week-long spring and winter for-credit seminars to students and local church leaders. The faculty especially invites seminar instructors to teach on particular theological issues or ministry related topics as well as providing expositions on individual books of the Bible. Every student is required to take hermeneutics, theology, and homiletics. 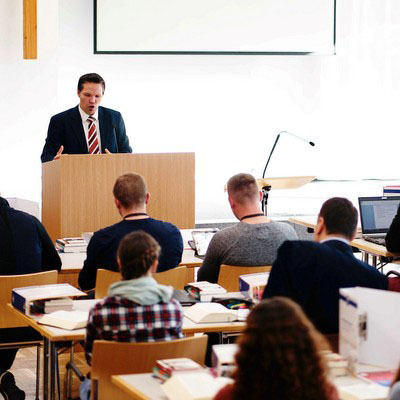 Through active participation in the ministry of local churches in Berlin, each student applies what he is learning so that he might develop his teaching, preaching, and pastoral abilities. This is essential because most EBTC students aspire to serve in pastoral and church planting ministries. Potential students must demonstrate an active desire for and participation in ministry and, where applicable, have the affirmation of their local church leaders in order to enter EBTC. All students must plan to work full-time or part-time to cover expenses during their training. To minimize housing costs during their training, most students live with members of Berlin Bible Church during EBTC weekends. Average student costs per trimester range from US$530.00 to US$920.00, including tuition, books, and travel expenses.